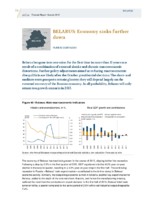 Belarus has gone into recession for the first time in more than 15 years as a result of a combination of external shocks and chronic macroeconomic distortions. Further policy adjustments aimed at reducing macroeconomic disequilibria are likely after the October presidential elections. The short- and medium-term prospects remain gloomy; they will depend largely on the eventual recovery of the Russian economy. In all probability, Belarus will only return to a growth scenario in 2017.